This guideline describes a coal dust explosion prevention and suppression management system which includes record keeping, training, monitoring and risk identification and assessment. The main risks in design, purchasing / construction, installation, maintenance, operation and incident review for prevention and suppression systems are identified. The guideline includes a Technical Reference Document MDG 3006 MRT 5 TR which gives practical guidance in the application of the guideline. 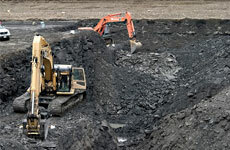 It consists of three parts: Preventing and suppressing dust explosions in underground coal mines; Tests for assessing stonedust; Test methods for coal mine roadway dust.